Two packed commuter trains collided head-on during the rush hour outside Brussels on Monday killing at least 20 people, a local mayor told Belgian media. The crash left several carriages on their side, according to witnesses while an official said doctors were carrying out amputations at the scene. The two trains hit each other near the town of Halle, about 15 kilometres (nine miles) southwest of Brussels in Dutch-speaking Flanders. Neither the national rail company SNCB nor the track operator Infrabel were able to confirm the toll. Infrabel spokeswoman Fanny Charpentier told AFP that police believed there were at least 12 dead. 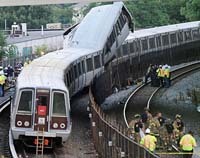 The accident caused major rail traffic disruption. Thalys and Eurostar high-speed train services in and out of Brussels are seriously disrupted, the two operators said. That crash was blamed on human error, including the fact that staff at two Belgian stations did not speak a common language.